Girl Scouts Cookie Flavored Lip Smackers??? Can’t wait for your Girl Scouts cookies to be delivered? 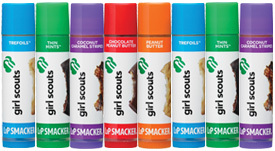 Well check this out, Lip Smackers has Girl Scouts cookie flavored chapsticks. I know I’m patiently waiting for my double order of Thin Mints but I think I’ll pass on the chapstick. I’m not a big fan of flavored lip products. I sure hope the Girl Scouts are getting a portion of the profit of their sales though. What do you think about this chapsticks? Would you try it?